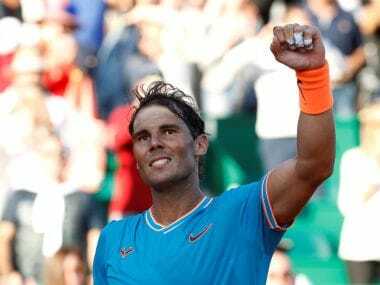 Paris: Rafael Nadal launched his pursuit of a record 10th French Open title in convincing fashion, while defending champion Novak Djokovic eased to victory under the gaze of new coach Andre Agassi. Reigning women's champion Garbine Muguruza began her Roland Garros defence with a straight-sets triumph over 2010 winner Francesca Schiavone. Nadal, who was forced to withdraw before last year's third round with a wrist injury, brushed aside 45th-ranked Benoit Paire 6-1, 6-4, 6-1 inside two hours. "I'm very happy to be back here after what happened last year. It's great to feel the support," said the 14-time major champion. Nadal broke Frenchman Paire eight times and recovered from a slight second-set wobble when he dropped serve twice in a row to surge into a round two meeting with Dutchman Robin Haase. "It's always at the start, happy for the victory. Was not an easy opponent in the first round, obviously. He's an uncomfortable opponent that already he had some good victories this year," added Nadal. Title-holder Djokovic strolled through his opener against Marcel Granollers of Spain, advancing 6-3, 6-4, 6-2. 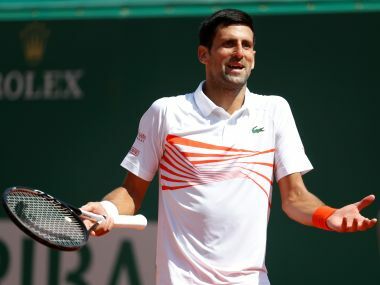 With 1999 French Open champion Agassi in the players box for the first time after agreeing a short-term coaching role, Djokovic experienced some trouble against the world number 77, being broken four times. "It's great to have Andre Agassi as coach and as a mentor. I will try to learn as much as I can from him," said Djokovic. The Serb, seeking to become the first man in the Open era to win all four majors on at least two occasions, will take on Portugal's Joao Sousa next. "Coming to this tournament for first time as a defending champion gave me, probably more than anything else, relief, because the anticipation and the pressure and expectations that I had also for myself but all the other people around me in the last three, four, five years before 2016 Roland Garros trophy was really big," added Djokovic. Muguruza's middling form this season saw her arrive in Paris with just three wins on clay, but the Spaniard dispatched former Paris champion Schiavone 6-2, 6-4. The fourth seed will meet Estonia's Anett Kontaveit for a place in round three as Schiavone, who turns 37 in June, bid farewell to the tournament for possibly the final time. "I know I played good here before. That doesn't make me extra confident this year. I think I just have to earn that confidence here, and, like today, going out there, trying to deal with things. That's what brings me confidence. Not remembering how I played last year." Second seed Karolina Pliskova won for just the third time in six visits to Roland Garros with a 7-5, 6-2 victory over China's Zheng Saisai. Former French Open runners-up Sam Stosur and Sara Errani, the latter coming through qualifying, also moved into round two. Canadian fifth seed Milos Raonic raced through with a routine 6-3, 6-4, 6-2 victory over Steve Darcis of Belgium. Raonic fired 15 aces and 44 winners to book a meeting with Brazil's Rogerio Dutra Silva, who saved two match points before overcoming Mikhail Youzhny of Russia in five sets. Former US Open champion Marin Cilic and Belgian 10th seed David Goffin also progressed, but American 14th seed Jack Sock was blown away in three sets by towering Czech left-hander Jiri Vesely. David Ferrer, the 2013 runner-up, outlasted American Donald Young in a four-and-a-half-hour marathon, prevailing 13-11 in the final set. Rising German star Alexander Zverev, seeded ninth, will return to finish his first-round tie against veteran Spaniard Fernando Verdasco on Tuesday after play was suspended due to darkness at one set all. Kristina Mladenovic played through pain to hold off Jennifer Brady of the United States and reach the second round. Mladenovic, seeded 13th, struggled to hold back tears after prevailing 3-6, 6-3, 9-7 in just under three hours, all the while encouraged passionately by her home crowd on Court Philippe Chartrier. She wasn't even sure if she would be able to start the match because of a back problem, and had to go off the court for treatment when she was 3-0 down in the opening set. "Back feels so-so," she said. "Unlucky thing happened to me yesterday. I did a wrong movement and I blocked my back. "This morning was way better, but it was really bad still for being, like, at the top level of playing. I took some medications when I went out at 3-0, and the doctor said to give it a try and see. ... You know, I just dig in there. I really don't know how I managed that." Mladenovic is confident of fully recovering before her next match against Italian qualifier Sara Errani, who reached the final in 2012. "Just extremely happy to give myself a chance to be still in the tournament, and I'm sure I will come back better," she said. Brady also led 3-0 in the third set before Mladenovic won the next four games, with the crowd loudly cheering every point. "I saw myself going out," Mladenovic said. "Honestly, from the first set I knew it would be difficult. Then, when I was leading in the second, that gave me a bit of confidence. "At 3-0 (in the third), honestly I really panicked. Then ball by ball I came back, I just kept telling myself it was just a break. Then it ended up being a marathon." It was the 88th-ranked Brady's first experience in the main draw at the French Open and only her second Grand Slam. She reached the last 16 at the Australian Open. "It stings a bit," Brady said. "Playing on stadium court at a Grand Slam against the home player, it was a great atmosphere out there, I had a lot of fun."